As the number of fixed broadband subscribers around the world climbs past one billion, service providers are preparing their networks to handle not just millions of homes, but billions of mobile consumers and trillions of connected devices. The Broadband Forum announced the billion-home milestone during its Executive Workshop at Broadband World Forum 2018 in Berlin in October. In the second half of 2018, according to estimates from Point Topic, the one billionth fixed broadband subscriber was signed up, probably in China. One billion subscribers is around half of all households in the world. 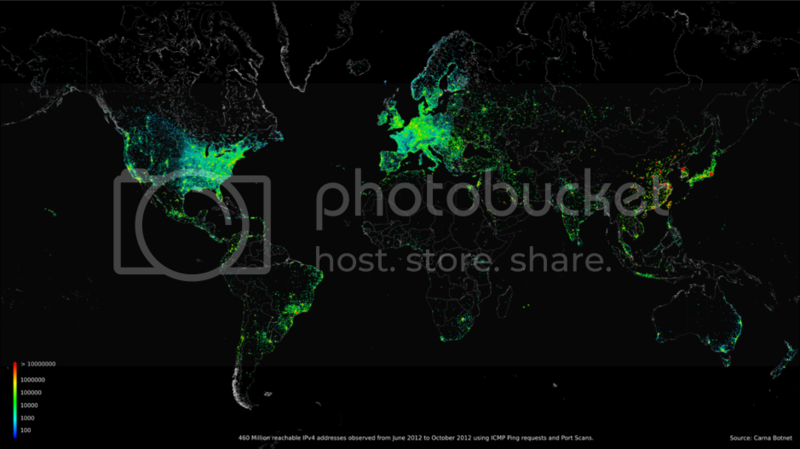 Figure: An unofficial measure of the size of the internet, in 2012 the Carna botnet counted about 1.3 million IP addresses that were reachable and in use. The scale of the challenge in connecting another billion homes – as well as entire populations of mobile phone users and other internet-connected “things” – cannot be underestimated. The range of topics being presented gave an indication of what keeps telecom executives awake at night. Topics ranged from progress in marrying open software with open standards to accelerate fixed and mobile convergence to managing (and hopefully monetizing) in-home WiFi networks to provide end-to-end service quality for the broadband consumer. Hardware developments took a back seat, though vendors announced software to address concerns about interoperability. China accounted for the majority of broadband subscriber additions, including 80% of new fiber broadband customers over the 12 months ending in June 2018, we heard. China’s fixed broadband roll-out, mandated by the Ministry of Industry and Information Technology (MIIT), has been completed ahead of schedule. China Mobile, once a pure mobile operator, now has more fixed broadband subscribers than the former fixed-line incumbent China Telecom. While fixed network deployment in China is slowing, mobile is accelerating. China Tower deployed more towers in three months than the US had done in the past three years, LightCounting heard. China Tower, which was jointly owned by China’s big three telecom operators and has a near monopoly on cell sites in China, owning 96.3% of them, raised $6.9 billion in IPO this summer. Chinese service providers are preparing to commercialize 5G in 2020. Whereas 4G was led by China, 5G deployment will be led by North America with Verizon launching commercial services in September 2018 when it began taking orders for fixed wireless access (FWA) service in four US cities based on a proprietary 5G network. The U.S. is also leading in smart speaker adoption and these are widely viewed as the control platform of choice for connected homes. Additionally, Verizon last week announced the successful trial of 5G New Radio over its 28 GHz spectrum, with plans to offer a “5G upgradable smartphone” on its network in 2019. Several speakers highlighted the Tokyo Olympics in 2020, which will be a testing ground for 5G innovation. Japanese mobile operator NTT Docomo has developed technology to live stream 360-degree experiences using 8K VR over 5G networks. A head-mounted viewing system creates highly realistic virtual reality experiences for sporting events that allow viewers to feel as if they are actually at the venue. To reduce bandwidth requirements, a central server slices up the views and one view is transmitted to the user according to their viewing direction. The required throughput to the end user over the radio network is estimated to be around 80Mbps, with up to 200Mbps in the backhaul. Commercial launch of 8K services is probably still years away, however. Separating the 5G fact from fiction can be a challenge. Hype is not entirely bad; it encourages competition, drives research and development and generates investment. “If it means that companies are going to roll out something innovative, then it [hype] is a good thing for the country at least, though it may not be a good thing for the shareholders,” was one observation at the conference. Now, with technology and commercial trials underway globally, and 5G-capable mobile handsets expected in 2019, the telecom industry is about to find out how reality lives up to the hype. This is a topic LightCounting will be following closely as it evolves. The use of optical transceivers in wired and wireless access networks will be covered in greater detail in the forthcoming LightCounting report “Next Generation Access Optics”, to be published in November 2018. The report includes a five-year forecast of transceivers used in mobile fronthaul, backhaul, and in Fiber-to-the-X networks, broken out by speed, reach, color, and technology. For more information, see https://www.lightcounting.com/Access.cfm.